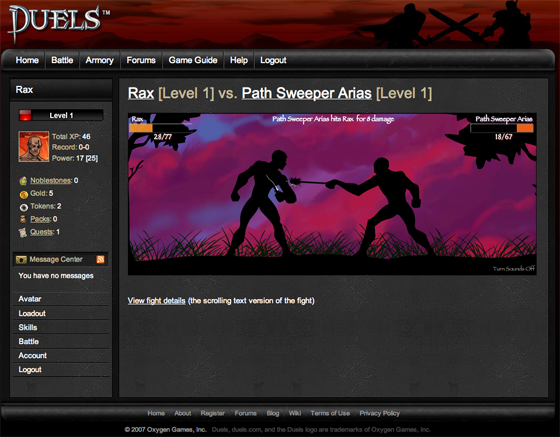 Duels is a new online role playing game that I’ve wasted most of the evening on. It’s both a social network and role playing game – create a World of Warcraft type character, buy him or her armor, weapons, etc., and then challenge other players to duels. Win and you get experience, gold and other stuff. Lose and you get nothing. Founder Andrew Busey (previously the co-founder of Austin startup Pluck) says he wanted to create a game where users could play against each other asynchronously and in 10-30 minute chunks, but still move their character forward in an addicting way. He’s done that – when you challenge someone else to a duel you set up how you want to fight but you don’t control the action in the duel itself. So the opponent can accept even when you are offline and the duel will still occur. The end result is a sort of merger of World of Warcraft and Magic: The Gathering. Every user also has a profile that shows their stats, avatar and fight history. 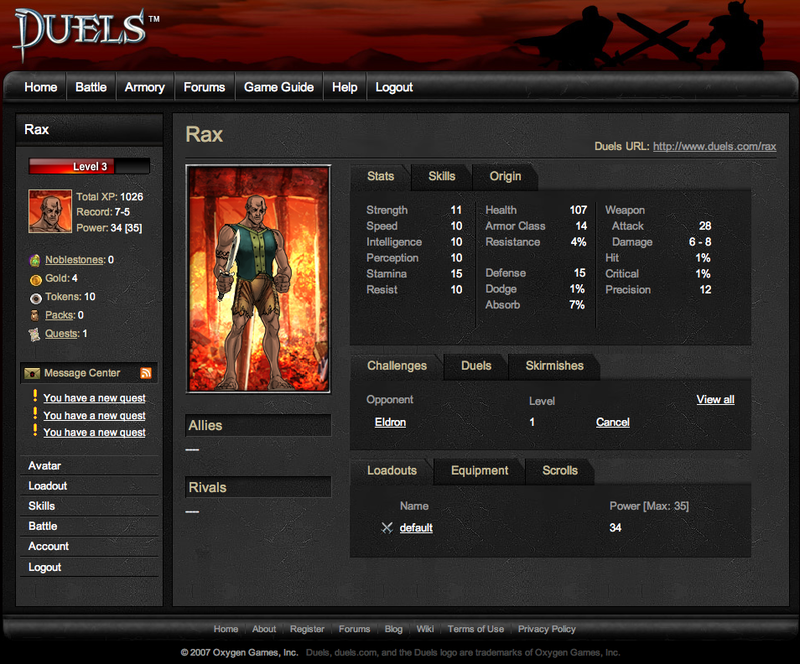 Other users can be added as rivals or allies, and/or commented. The game is addicting and fun. It hasn’t officially launched yet so there are very few users to fight. There are a number of game-controlled opponents ready and waiting, though. Be warned: Like Kdice, Desktop Tower Defense and other games we’ve covered, be prepared to lose a few days to testing this out. Duels is the first product of Challenge Games, the parent company behind the game.